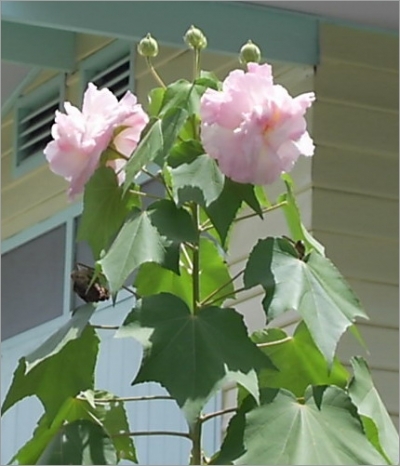 Hibiscus mutabilis, the Confederate Rose, or Cotton Rose, is a decidious shrub that can reach heights of 12 to 15 feet with a woody trunk; however, a multi-trunk bush 6 to 8 feet tall is more typical. Hibiscus mutabilis is native to Southern China, but is a favorite landscape plant in mild Winter climates. It is among the most spectacular and easily grown plant for use in the border. The flowers open pure white and change color over a three-day period until they are deep pink and then as they die assume a dark blue-pink hue. The most notable characteristic of this flowering shrub is that flowers of three distinct colors appear on the bush simultaneously as the blooms color cycle independent of one another. It has spectacular flowers at a time of year when not many other woody ornamentals are happening. It is in flower from August to October, and the seeds ripen from September to November. Single and double flowered varieties are available, both having quite large blossoms that are 3-5 inches across. This should be the single variety. Individual flowers last only last a few days, but each plant may flaunt several flowers at once. The flowers are hermaphrodite they have both male and female organs. After flowering a round, hairy capsule forms which dries and releases the seeds. The large deciduous leaves are 5-7 inches across, bright green, hairy on the undersides and deeply lobed.